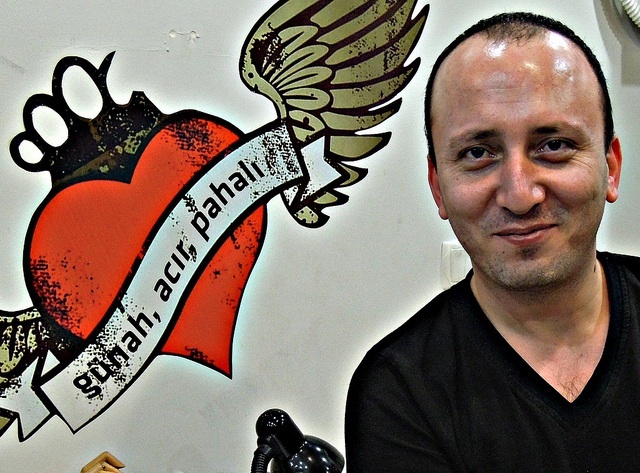 “Sinful, painful, and pricey.” Those words, blazoned across a winged heart on the wall of Magic Hand Tattoo Studio, speak volumes about Istanbul’s tattoo culture and about Taner Arslan, an artist who has been navigating it for more than a decade. Arslan’s outfit occupies a small storefront in an alleyway off of Knowledge Street in Istanbul’s Bakirkoy neighborhood. Neighbors include a tarot reader, a law office, and a bar. Arslan, whose boyish simper stands in sharp contrast to the ink scrawled up and down his left arm, has turned his big-city studio into something of a small-town barbershop. Along with tattoos, he daily offers up relationship advice, religious opinion, and philosophical musings. Since learning the trade twelve years ago alongside friends practicing on American naval officers, Arslan, 36, has developed into one of Istanbul’s finest. This January, he took time between a dandelion tattoo and six and a half cigarettes to talk with me about ink, sin, soldiers, and how tattoo culture is slowly infiltrating this predominantly Muslim country. Tell me a little about how you came into this job. I just happened upon this job by accident, mistakenly really. Around the time when I had gotten divorced from my first wife, I was really depressed, and I had some friends who were tattoo artists. They were guys who had gone down to the Mediterranean, down to the Agean Sea where American war ships come in. They went to the city of Marmaris, where an aircraft carrier had just come in, to do tattoos for the American sailors. They said, “Hey, we’re going there to do tattoos, come along, hang out, it’ll be like you’re on vacation.” Not long afterward, I got tired of hanging out and started to help them. For two years I cleaned around the place. “Go here, get this, draw this,” etc, etc. That’s how it all started. I worked for free while they trained me. I got room and board in exchange for my help. Did you like to draw from childhood? My one and only good class in school was drawing. All the other courses were terrible. My art teacher would invite me, and four or five guys like me, to the school on the weekends and give us private lessons. Did you ever think you’d grow up to be an artist? In Turkey at that time, families had the opinion that their children shouldn’t grow up to be artists. The thought was, if you’re an artist, you can’t really make much money. My parents didn’t want to discuss the topic of me being an artist, so I gave up on the lessons. I dropped out of high school. Only years later did I finish school by taking night classes. In the end, I don’t really have that much training in the field of drawing or art, but my parents have accepted my occupation. I’m not out there stealing or robbing to make a living. Just working and earning money. What is the history of tattoos in Turkey? It’s not old at all. The oldest tattoo artist has maybe been doing it for 40 years. Ten years ago, there may have only been 50 artists in the country, but now it’s significantly more. Of course, there is the tradition of henna nights for bachelorette parties. Years ago, a long time ago, in southern Turkey there were people who did something like tattoos, beside the eyes or behind the ears. It was a cultural thing from the east, maybe from Afghanistan. They did it to gain blessings, or for good health. They were supposedly made from mother’s milk. Women would tattoo women, and men other men. But that culture has since passed. You mentioned that the Muslim environment sometimes makes your job tough. How so? In a Muslim environment, there’s a portion of the society that looks down on tattoos. The first thing that a customer asks is whether or not this is a sin. That being said, there’s a new generation that has a different perspective, and the number of those giving and getting tattoos is definitely growing. What do you say to customers who are worried that tattoos are somehow antithetical to their religion? However, tattoos are not explicitly forbidden in the Koran; that’s just an assumption. And when you look at most people’s lives, from the time they get out of bed in the morning until they lay down at night, they do a whole bunch of things that are considered sin. They have girlfriends they’re sleeping with. According to Islam, that’s sin. They gossip: sin. They lie: sin. They steal. You know, it seems kind of strange to me when they come in here asking whether or not tattoos are a sin while all day long they’re doing things that are clearly sin. That’s why I have the sign up on my wall, that tattoos are “sinful, painful, pricey.” Three words. Hey, at least I’m an honest guy. But you just have to be a Turk to understand the mindset. It’s complex here. What did you learn from tattooing American soldiers in Marmaris? In Marmaris there was a military base, and I think it was connected with NATO. Spanish, British, and American naval ships. We used to get a phone call letting us know a ship was coming in, so we’d hurry up and rush over to the shop. The soldiers would stay for a week at a time. They would be coming back from a tour, and they wanted tattoos of religious symbols, a cross or the Virgin Mary. After that, maybe they’d want the name of a sweetheart. A lot of them already had tattoos, so you’re observing, inspecting the styles of the ones they had done in America. Those soldiers helped us learn the trade much faster. What kind of tattoos are popular in Istanbul? Lately the ones that people want most are stuff they’ve seen on TV, on shows like CSI Miami. Before that, it was angels, butterflies, and feminine models. For the most part, people want small tattoos because, as I said, opinions about tattoos haven’t totally softened here yet. So people have them on their arm, or small ones around their wrist. There are people who have large ones, but those are almost always on covered areas of the body, like on their backs. The small ones run from 50TL (or about $30) and go up from there. What is the most difficult type of tattoo to do? Portraits are the most difficult. But most people don’t like to carry around a portrait of someone on their bodies. Like if their dad or mom dies, if they lose them, and I offer to do a portrait, normally they just opt for a tattoo of their name. If I was living in America, for instance, I’d probably do a hundred portraits a year, and I could get practice, get better. But here, at most, I do ten portraits a year. I’ve done a portrait of Jesus, another of Ataturk. One of the hardest I ever did was of Ratatouille, the rat from the Disney movie. But what makes a portrait difficult is the eyes. If you mess those up, the whole thing can just look stupid. Why do people in Turkey get tattoos? For the most part, if we had to slice it, they probably want to satisfy their ego, or they’re trying to make themselves happy. The other half see someone with a tattoo they like and want to imitate them. Then another group consciously decides to have a tattoo all on their own as a personal symbol, to feel and look different. How has the tattoo culture developed in Turkey in the last decade? Just five years ago we couldn’t get quality materials and tools. We would place an order over the internet, and it would get caught up in customs, creating a problem. Since it’s chemical in nature, you couldn’t get the dyes or colors easily. If we had a friend or aquaintance coming in from out of the country, I would tell them I needed something, and they’d try to get it through in their bags. Nowadays, it’s so much easier. All of the equipment, the same that guys in Europe and America use, are at our disposal. That being said, it’s still very expensive here. There are a few companies who import the stuff. But for a particular color you pay $10 for in America, I might pay $50. What are some of the other difficulties associated with running a tattoo parlor in Turkey? There isn’t any kind of regulation of tattoos in Turkey. For instance, I don’t have an official liscense to do this. So if you get a crappy tattoo from me, there’s nothing you can do, except maybe beat me up. Maybe it will be solved within the next ten years, but right now it’s as if I don’t even exist. And there just isn’t much respect for a tattoo guy here. Customers that come from outside the country take their picture with me, get my autograph. But around here, I’m just the bad guy. From the viewpoint of others, I don’t really sell a product, and I’m not really an artist. I want to develop personally, to continue giving tattoos, but people here don’t yet have a sense for style, they don’t know how to think outside of the box. So it’s 50/50 if I’ll stay here or move elsewhere. In my opinion, a tattoo artist that says he doesn’t make mistakes is no artist at all. You’re a professional tattoo artist when you know how to correct your mistakes, to camoflauge them. There is no such thing as a mistake-free job. If I make a serious mistake, I tell the customer right away. I don’t try to hide it. Of course, I fix it, but I don’t make a mistake so big I can’t fix. One time, an American soldier came to me, and he wrote down his girl’s name, Shanna. It needed to have two ‘n’s, but he only wrote down one. He gave the paper to us. We did the tattoo. He loved it. Then he looked carefully in the mirror. So what do you think we did? We put a tiny little ‘n’ above the other one. What am I gonna do if he writes it down wrong, a name from another language? It was hilarious. First of all, Luis Royo, who is a Spanish artist. I also like the work of the Swiss HR Giger, the man who designed stuff for the Alien movies. As far as tattoo artists, there’s Guy Aitchison, an American. I love his style, but unfortunately I can’t do it here. His creations are big, colorful, and also expensive, too expensive for Turkey. Are there any tattoos you can’t do, or wouldn’t do? There isn’t anything I can’t do, but around guys or girls private parts, I really don’t like to do tattoos. Some people just don’t take care of themselves; they’re not clean. For safety and hygene, I just don’t care to do that kind of work. But if you insist, I’ll do it. I won’t do tattoos on animals. You know, if people are worried about their dog getting lost, they sometimes want their phone number on his ear, whatever. I don’t like to do it; it’s not what the animal wants. I guess if a dog walked in and asked for a tattoo for himself, fine, I’ll do it. In other countries, its very common to work on pigs, to practice on pigs, but we can’t find any pigs here. If we could find some pigs, they’d probably end up carrying around some tattoos. I noticed you have tattoos, as well.